A page from the full score of one of the versions of Helen Traubel’s first song in PIPE DREAM. The number was revised three times and then replaced by something else entirely. We’re going to finish up our three part exploration of musical and script restorations with a peek at the new edition of PIPE DREAM we’ll be bringing on line next year. PIPE DREAM is an especially exciting addition for us as, due to various and sundry complications, this show has not been available for performance in many years. PIPE DREAM was R&H’s 1955 musical adaptation of John Steinbeck’s SWEET THURSDAY, a novella Steinbeck wrote with a musical adaptation in mind. Frank Loesser first considered outfitting SWEET THURSDAY for the Broadway stage, but eventually passed on it. Eventually Rodgers & Hammerstein became interested in it as a vehicle for famed Metropolitan Opera soprano, Helen Traubel, who had recently performed an evening of barrel house renditions in her Las Vegas nightclub act. Traubel was to play the madam of a house of ill repute. She was eager to show audiences her bawdier side, and Rodgers delivered her a score written in true Broadway belt keys. But it didn’t work. The original rehearsal materials indicate constant revisions in Traubel’s musical material as her part was readied for Broadway. Slowly, as she began to get cold feet about what her New York fans would think about her as a belter, the keys of each of her numbers edged upward. And then the numbers themselves began to change. One song was written three different ways before the show opened. (Our restoration will retain all three versions, including the one that made it to the original cast recording but was not, to our knowledge, ever performed on stage.) Finally, at some point during the run of the show this number was replaced entirely by something else that was not as much of a song as something that sounded like an excerpt from Traubel’s Vegas act. (To a Cole Porter tune she sings, “The beguine has begun, and it’s driving me crazy!”) This from the composing team whose KING AND I was still packing both legitimate theatres and movie palaces! What was going on? Finally, one can only presume to placate the unhappy star, Traubel was given a second act reprise of the one sure-fire hit song in the show, “All At Once You Love Her”. No matter that this song was written for the show’s romantic leading couple and had nothing to do with Traubel’s character. Perry Como made a hit of it, she wanted it and she got it. R&H wrote a beautiful verse to make the song work for her in the scene in which she sang it and Helen Traubel’s reprise of “All At Once You Love Her” was one of the loveliest moments in all of PIPE DREAM. On one hand, it’s easy to trace the development of a show for which so much of the original rehearsal and performance materials still exist. 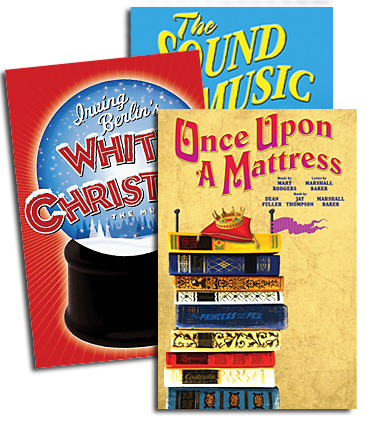 We have all the rehearsal scripts and vocal parts in our archive along with the complete set of original orchestra parts (still in their stand folders from the orchestra pit in the Shubert Theatre) and all of Robert Russell Bennett’s (and Joe Glover’s!) 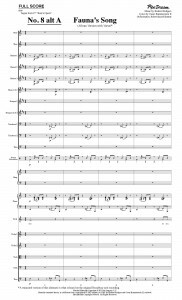 full orchestra scores. Because PIPE DREAM was not as immediately successful as the other R&H hits there was never a complete performance version created for licensing. A script was prepared and a beautiful piano vocal score was created and published (and is still available from Hal Leonard) but only a few of the orchestra books were ever printed for reuse. On the other hand, the changes and alterations made while the show was being prepared seem endless determinations regarding them can be difficult to come by. Traubel’s songs continued to be transposed, both for her and for her understudies, as the show ran. When she walked less than a month before the end of the run, Nancy Andrews stepped in, and everything was retooled one final time for her. The Traubel material now in the orchestra books is that which was created for Ms. Andrews a scant two weeks before the Broadway run of the show ended. There is a lot of dance music (by John Morris, famous for his film scores of Mel Brooks’ THE PRODUCERS and YOUNG FRANKENSTEIN, as well as writing A TIME FOR SINGING.) This also never seemed to take final form. Even where the dances were placed is somewhat of a question. Some of the orchestra books have a chunk of the second act dance music moved to the very top of the first act. But there is nothing to document that this switch was ever performed in the Broadway production. And there are all kinds of little nips and tucks and alterations on the original cast album that are not reflected in any of the existing materials. Unfortunately, whatever instrumental parts might have been created specifically for the recording are now lost. In most of our decisions regarding the restored edition of PIPE DREAM we will be offering as many options as we can. Is Fauna, the character Ms. Traubel portrayed more effective as a belter (as her part was conceived) or as a legitimate soprano (as she performed it?) Since orchestrator Robert Russell Bennett first scored much of Traubel’s material in lower keys we still have access to and will be offering Fauna’s songs as R & H originally intended them. But, as the higher transpositions exist, and as these constitute more accurately the original performances of the show, we will offer these as well. There are also a few verses to songs and interior sections that got lost along the way, and these we’d like to reinstate as options for future productions. In some ways this most documented of R&H scores is proving one of the most difficult to pin down. The important thing is that we think PIPE DREAM is going to be a real revelation, lending exceptional insights into the Rodgers & Hammerstein cannon and providing genuine entertainment as it does so. The script is funny and touching. The lyrics are filled with character and poetry and the music is enchanting. The composer and his orchestrator filled the Shubert Theatre with one of the largest orchestras Rodgers had ever used: five reeds, eight brass, twelve strings, bass and percussion as well as harp and piano. The orchestration is, of course, superb. The existing cast recording hardly does the score justice. So we’re all looking forward to the next downbeat that will bring PIPE DREAM to life once again. Will Fauna (the Helen Traubel role) be a soprano or a belter this time around? We don’t know yet. One of the happiest headaches you get from working on a restoration is that you never stop learning new things about a musical score and the show that surrounds it. There is always one more “I” to dot and one more “T” to cross. And maybe, just maybe, the chance to uncover one more moment of musical theatre magic that was almost forever lost. Read Part 1 and Part 2 of our blog on Restoring Musical Classics.